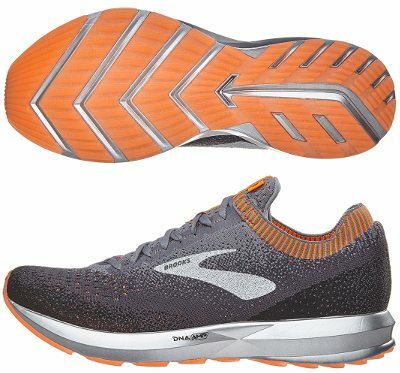 Brooks Levitate 2 are neutral cushioned running shoes. It does not look like the fancy Brooks Levitate 2 is going to be the new flagship within Brooks lineup but most likely a luxurious and pretty expensive running shoe where american brand tests its most innovative technologies like DNA AMP foam and Fit Knit upper before spreading them among "more standard" running shoes. Anyway it does not help to be located halfway between premium Glycerin 16 and popular "go-to-shoe" Ghost 11. Revamped upper is the major change compared to original Levitate. The most impressive thing about new Fit Knit mesh (similar to well known FlyKnit from Nike or PrimeKnit from Adidas) is that it makes fused overlays unnecessary to provide a secure and snug fit while upper is well ventilated for improved breathability. The other strong point is the redesigned heel collar zone where padding has been increased to better protect Achilles area (something Adidas premiered and has been used even in recent Adidas Solar Boost) and last eyelet has been moved to external band surrounding the heel for custom fit. There is no change in midsole of the Levitate 2 which opts again for innovative DNA AMP foam although there is no much room for such a heavy running shoe, please expect a smooth but rather slow transition. For more responsive and lighter options from the american brand, the Launch 5 is worth a try. Outsole does not change either keeping a similar configuration than TriFlex from Saucony and even gorgeous translucid rubber used seems pretty similar to one available in Saucony Freedom ISO 2, hopefully it achieves the same great performance.